The chief magistrate for England and Wales has spoken of his regret at failing to save an historic magistrates' court from closure. Bow Street, where some of the country's most notorious criminals made their first court appearance, has been sold to developers and will close on Friday. Senior district judge Timothy Workman said he had done his best, but figures had failed to add up. Developers plan to transform it into a luxury hotel and museum. Irish based Edward Holdings announced that the complex, due to be called "The Bow", would "acknowledge the building's illustrious past". Referring to IRA suspects who had appeared at the Grade II listed court, the firm said it was also aware of the importance to "Irish as well as to English history". The cell block is expected to be incorporated into a museum and the cells converted into hotel rooms. Edward Holdings said the courtrooms, the facade and some staircases and lifts would be preserved within the hotel. A planning application is due to be lodged before the end of the year. Judge Workman said it was probably one of the most famous courts in the world. On its current Covent Garden site since 1881, a host of famous defendants have passed through its dock from Oscar Wilde and Jeffrey Archer to the Krays as well as various spies and al-Qaeda members. Mr Workman said: "I did my best to see whether there was an opportunity to redevelop the courthouse on this site, but I'm afraid I lost that. "The Lord Chancellor did consider the position and I know he tried hard to find a way of preserving the heritage but financially the figures did not add up. "Unfortunately, there is no value to be placed on history and heritage." At the time of the sale, Lord Chancellor Lord Falconer of Thoroton QC, said the capital raised would be re-invested in a court building programme, aimed at providing a modern, effective justice system. Mr Workman said he hoped to salvage the dock and the judge's chair from court one and a royal coat of arms from above the magistrates' bench. He said he would miss the great atmosphere of court one. "It is a place where you never know what you are going to be dealing with next...all human life is there, a lot of it very sad," he said. 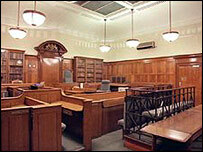 All staff and caseloads will be moved to Horseferry Road Magistrates' Court.